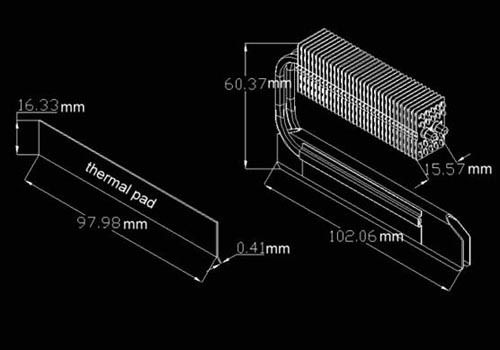 Now you can install as many memory modules as you want and still be able to install HR-07 Duo which still incorporates the two-heatpipe design but having one set of radiator fins instead of two as in the original HR-07 for that fine balance between performance and space saving. Easy installation, space saving, no tools needed, able to install 4 DIMM, high cooling performance, and extending the life expectancy of your memory modules. What more could you ask for? The Thermalright HR-07 Duo Memory Heatsink Type H (High Rise) is designed for the power builder looking for silent passive memory cooling. The HR-07 Duo is easy to install and can support up to 4 DIMMs. Note: In order to install HR-07 Duo, you will have to remove the heat spreader on your memory module. HR-07 DUO has two types and I have two memory modules. Which type should I purchase? I might plan to get more memory for my system later on. You can purchase either type of HR-07 DUO. If you choose to purchase and install the Type H first, for later added memory modules you will need to purchase the Type L. Vise versa, if you choose to install the Type L first you will need to purchase the Type H for later memory upgrade. More FAQ?